Kate Bullen has identified 10 inexpensive and easily-accessible Superfoods that help keep you and your family healthy now and in the future. High in nutrients including antioxidants, phytonutrients, vitamins and minerals. Whole foods without processing, or only minimal processing to get it from farm to plate. 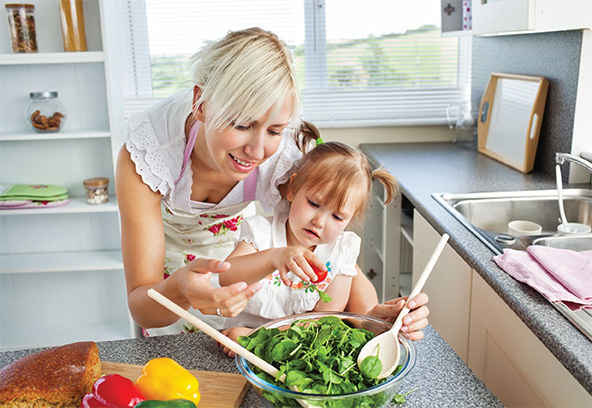 I have also thought about Superfoods in the life of a family and aimed to include foods that easily fit into a family’s diet. What you won’t see on my list of Superfoods is expensive and hard to find foods. I have included foods that are superior to their counterparts in terms of what nutrients they contain, so essentially you are getting a good bang for your buck, and these are foods that are available all year round. Antioxidants in foods protect our body from free radical damage - much like a car is protected from rust by its special paint coating. Antioxidants from wholefoods are a great way to protect your body. Antioxidants in foods protect our body from free radical damage – much like a car is protected from rust by its special paint coating. Antioxidants can help prevent diabetes and heart disease. I have included many foods on my list which are high in antioxidants. Many Superfoods are rich in phytonutrients – which are what give vegetables their strong colours. There are many, many phytonutrients that have been identified in food – some of the more common phytonutrients include carotenoids, polyphenols, flavonoids and isoflavonoids. Phytonutrients and antioxidants may be emerging as a group of compounds found in foods that have the potential to reduce the risk of many lifestyle diseases. But, a word of caution, phytonutrients and antioxidants should be eaten as part of whole foods. Don’t go looking in the pharmacy aisle for a pill or supplement that contains phytonutrients or antioxidants because we just don’t know if it is the phytonutrients and antioxidants on their own, or the combination with fibre or even the vitamins and minerals that are found in these Superfoods, that provide their health benefits. So the best advice is to eat them as a whole food. Garlic has been shown to have a protective effect against some types of cancer, and is a great way to add flavour to food without unnecessary fat. Broccoli and cauliflower are part of the cruciferous family of vegetables and take their name from the shape of their flowers. I have listed these vegetables first because I really do believe they are superior to other vegetables. This group of vegetables has been given a gold star time and time again as they consistently show up as having the potential to reduce our risk of cancer. That alone is a huge reason to be eating more of these vegetables! They are a great source of phytonutrients, antioxidants, vitamin A, C & E and folate; they contain fibre to improve our bowel health; and they are a source of calcium. These vegetables can be eaten raw, lightly steamed or stir-fried. Baby spinach is an excellent source of fibre, iron, vitamins A, C, E and folate – excellent for vegetarians, while Kale is a great source of vitamins A and C and a good source of calcium as it has the most calcium of any vegetable. Both baby spinach and kale are from the family of leafy green vegetables and are high in antioxidants and carotenoids – an important phytochemical to help reduce our risk of some cancers. These leafy green vegetables are great added to salads or are easily hidden in casseroles or pasta sauces. Or you can add a handful of baby spinach into a smoothie for some extra kick – we call them Superman Smoothies! Once upon a time, nuts and seeds were shunned upon because they are high in fat. But guess what? We know that the fat is mainly mono-unsaturated and it is good fat! Almonds are a fantastic source of fibre and vitamin E – which means they are high in antioxidants. You don’t need to have your almonds activated, but when choosing try for unroasted as the heating can destroy the thiamin in almonds. Add onto your breakfast, into a smoothie or enjoy in moderation as a snack. Chia seeds are a bit newer to the market and are a great way to add some extra nutrients to meals or baking. Chia are packed full of fibre and antioxidants (it also contains omega-3 fats but unfortunately our body doesn’t convert the omega 3 from seeds as well as it does from other foods such as salmon). But don’t let that stop you – the healthy fat in nuts and seeds can help keep our heart healthy and our bowels regular – both very good things! Don’t be afraid of carbohydrates and grainy foods! Choose grains that have very little processing, and include them as only one quarter of your meal – not half your plate. In winter, oats are a great way to start the day as porridge, or you can eat the oats raw with your favourite toppings – great as an afternoon snack. The main reason I have included these as a Superfood is because they are wholegrains, which are a fantastic source of antioxidants, phytonutrients, fibre and B group vitamins including thiamin, riboflavin and niacin. We know that oats are a great source of beta-glucan which can help control cholesterol levels. Aim for half a cup as a serve of these foods to help control your overall energy intake. Add some fruit, yoghurt and you will have yourself a Supermeal. You could even go one step further and make an overnight oat and quinoa pudding for breakfast – yum! Legumes and lentils are foods that are often overlooked in our western diet. There is growing evidence to show that legumes and lentils can be beneficial in reducing our risk of diabetes and heart disease. Legumes and lentils are readily available canned – just look for varieties without added salt – or you can have them dried or even frozen. Add some cannellini beans into your next casserole or soup (kids won’t even notice! ), have some baked beans at breakfast, or try some edamame as a great snack or addition to a meal. Carrots are a staple vegetable that are versatile, cheap and available all year round. They’re a great snack – try serving some on your next dip or cheese platter for added nutrition and crunch. Beta-carotene is one of the main phytonutrients in carrot and is what makes them orange. They also have many other phytonutrients, antioxidants, along with fibre, potassium, and vitamins B6, C and K. Research has shown that diets rich in beta-carotene can be protective against many types of cancer. Delicious fresh, but also easily added to every cooked meal from stir-fry to soups. Salmon is well known for being a fantastic source of omega-3 fats which we know can reduce our risk of cardiovascular disease. Include two salmon meals each week and you will be getting enough omega-3 fats to meet your dietary needs. As an added bonus, salmon is a great source of Vitamin A – giving it a gold star for containing antioxidants. Enjoy it fresh or canned, and you can of course have it raw, poached, steamed, baked or grilled. So many delicious options! Tomatoes are a great source of lycopene – which is the phytonutrient that gives tomatoes their colour. Diets high in lycopene have been shown to reduce the risk of prostate and some other cancers and heart disease. Tomatoes are also great sources of vitamin C and vitamin A. Tomatoes are readily available all year round and you can enjoy them fresh or canned. 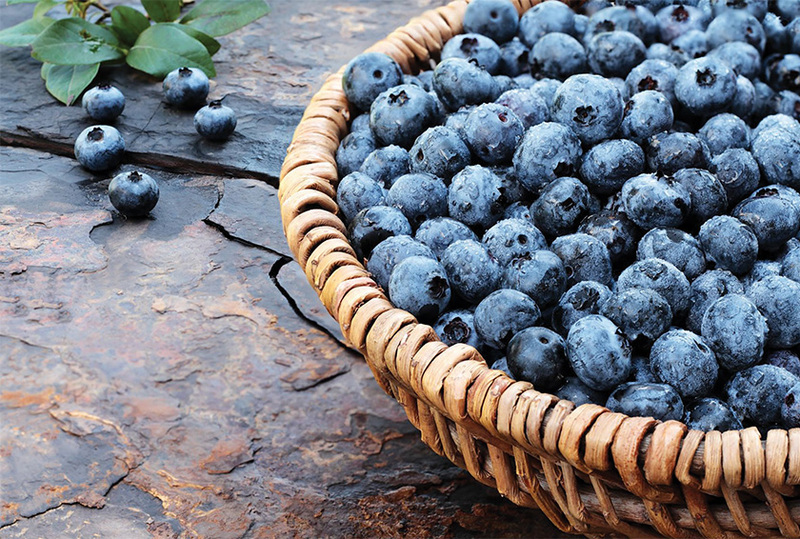 The intense blue colour of blueberries proves their nutrient worth – they are packed full of flavonoids (a type of phytonutrient), antioxidants, vitamin C and fibre. Enjoy them fresh or for an easy, on-hand and more affordable option keep a pack in your freezer. They are delicious eaten frozen as a snack, or add them to some greek yoghurt, cereal, a smoothie or to use in baking. Garlic is a member of the onion family and a great source of phytonutrients. For a milder option choose garlic chives. You can enjoy garlic raw, in cooking or roasted. Garlic has been shown to have a protective effect against some types of cancer, and is a great way to add flavour to food without unnecessary fat. I would encourage you to trying including more of these Superfoods on your plate and maybe even as a swap for other less-super foods. For this your health will thank you! Carrots really do help us to see better! The beta carotene in carrots is converted by our body to Vitamin A which helps with vision. Tomatoes are really a fruit not a vegetable because they have seeds in the middle, but we usually eat them as a vegetable. Wherever possible leave the skin on fruits and vegetables as many of the vitamins are in the skin.